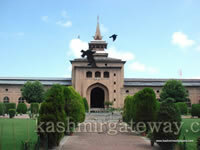 Srinagar (the land of rising sun) at one mile high city was founded by the King Pravarasena II over 2,000 years ago, and the city of Srinagar has a long history, dating back at least to the 3rd century BC. The city was then a part of the Maurya Empire, one of the largest empires of the Indian subcontinent. 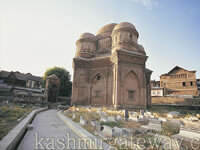 Ashoka introduced Buddhism to the Kashmir valley, and the adjoining regions around the city became a centre of Buddhism. In the 1st century, the region was under the control of Kushans and several rulers of this dynasty strengthened the Buddhist tradition. Vikramaditya (of Ujjain) and his successors probably ruled the regions just before the city fell to the control of the Huns in the 6th century, and Mihirkula was the most dreaded ruler of the city and the valley. 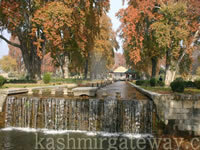 Just onthe out-skirts of Srinagar lie Chashmashahi (“The royal spring”), Nishat (“abode of peace”) and Shalimar (“abode of love”) where Mughal emperors once relaxed with their exquisite queens. An explosion of colour in Asia’s largest recreational tulip garden has emerged after 60 varieties were imported from Netherlands and planted in the Siraj Bagh Tulip Garden only a few months ago. 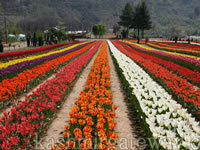 The sight of 12 lakh blooming tulips is magnificent. The bloom is one week early but no one’s complaining. 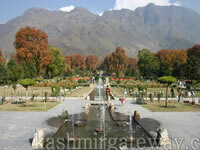 Set in the foothills of the Zabarwan Mountains on the banks of the Dal Lake, this garden is fast becoming another tourist attraction. 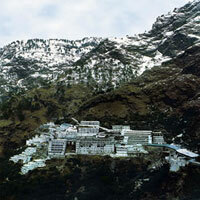 The antiquity of Shankaracharya temple is akin to that of Vaishno Devi in Jammu. The temple, dedicated to Lord Shiva, has legends dating back to 200 BC. Built to overlook the valley, situated atop the Hill it has the devout climb the hill with offerings in their hands, a motorable road has been built leading to the TV Tower on the hill. 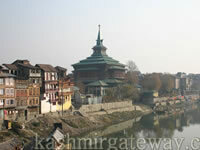 The sacred temple is situated to the south east of Srinagar. 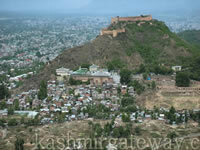 However, neither the hill nor the temple retain their pre-historic names, Gopadari and Jyeshtheswara respectively. The temple is built on a high octagonal plinth approached by a flight of steps. 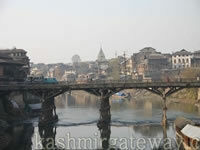 You can have an ariel view of vale of Kashmir and especially of the city of Srinagar. At one time the exclusive hunting preserve of the local Maharaja and now a beautiful sanctuary spread over an area of 141 sq.kms owing to a strict conservation programme. Dachigam is the home of 20 mammal specials including the Kashmir Hangul, Snow leopard, black bear and over 15 species of avifauna (18 kms drive). 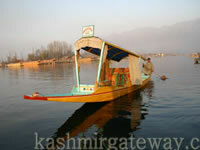 You can enjoy beautiful rides on shikaras; visiting Nehru park, Kabutur Khana, Charchinari, Floating Islands and typical vegetable farmer villages on the Dal lake. The canals are spectacular. 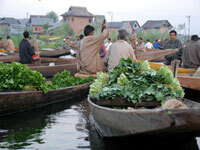 Since hundreds of years there has been always a floating vegetable market every day early in the morning for few hours. 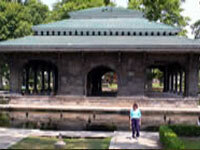 In heart of the Dal Lake. 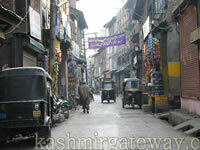 Vendors glide along the backwaters to an open area of the lake which for a few hours becomes a chaotic market. Their boats are brimming with freshly picked greens, peas, turnip, lotus roots, kohlrabi, squashes, radishes, carrots, cabbage, cauliflowers, tomatoes, onions, fruit and flowers etc. They trade, they haggle (sometimes it sounds like they fight?) 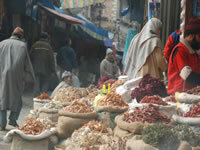 apart from cash transaction centuries old barter system is involved also in this fascinating market. 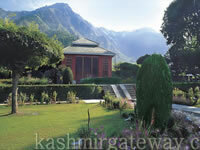 Amidst thick pine forests and green pastures inlaid with brilliant flowers lies Pahalgam (“Shepherds village”) about 95 kms north-east of Srinagar. The mountain town along the bank of river Lidder is known for its trout fish, both rainbow and brown and is the starting point of many a trek, excursions to glaciers like Kohaloi and hindu shrines like Amarnath and other scenic places. 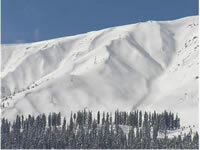 Camp-out, pack-a-picnic, soak in the sun, melt in a bonfire, smile, you are in one of the most picturesque resorts in Kashmir. 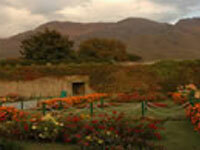 About 50 kms away from Srinagar, Gulmarg (“The meadow of flowers”) is a dreamland in the sky. This is world famous golf course (highest in the world) in summer and a lovely skiing resort in winter. 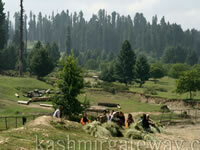 This golden meadow is about 100 kms from Srinagar. A gushing river Sindh is the highlight of this meadow, flowing down from snowy heights into the dense woodlands of fir and silver birches. 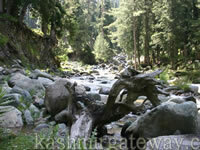 Glaciers pour down this river from Himalayas on to the many camping sites in Sonamarg. Also famous for trout fishing. 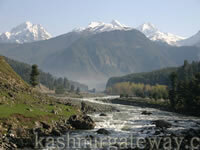 One hour drive from Srinagar, this idyllic meadow is ideal for a day’s picnic or a short walk along the mighty ‘Doodh Ganga’ river, its name deriving from its milk white foam. Picnic on its banks or simply doze in the sun. 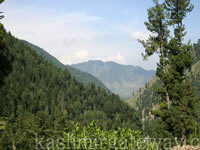 A starting point for many peaks like ‘Trata Kutti’ and ‘Sang-safed’ – this is a trekkers base. 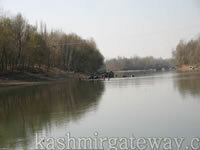 Wular is Asia’s largest fresh-water lake, formidable in its size is like a chameleon with every mile of its strectch.The calm waters of Manasbal lake are retreat for bird watchers. Glide on a shikara on the lake with only gentle sound of the water and the birds to break the silence (2 hours round trip). As on approaches the great waterfall of Aharbal, the distant rumble turns into a roar. Dotted with delighful picnic spots this waterfall is also the starting point for intresting treks. (1½ hour drive). A trekker’s paradise (2 hours very scenic drive) swathed in coniferous forests, gurgling streams, hidden grassy meadows, where your only company is the sound of the gushing Bringhi river or an occasional shepherd tending his flock. Daksum is also famous for its trout – an angler’s heaven. 1 hour drive from Jammu via Katra, this temple town over-hangs the cliffs about Tawi where millions journey to pay homage at the cave shrine.One of several surprises in the sanctuary of Gods.